Wolfgang Mock knows grains. 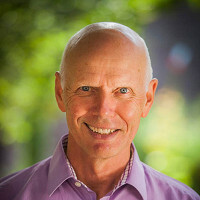 He’s been designing home grain mills for over 30 years and is passionate about spreading the knowledge that, when it comes to grains, freshness matters. When grains are commercially processed, the germ and bran are stripped out to prolong shelf life. But that’s where all the good stuff is—like fiber, vitamins, and antioxidants. By grinding your own at home, you can enjoy fresh, nutrient-packed wheat, rye, quinoa, and other grains whenever you want. 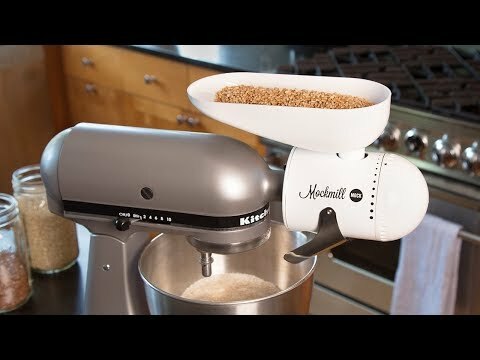 Wolfgang invented a mill attachment that works with many common stand mixers, and he also created a countertop-friendly self-contained mill. Ceramic milling stones do all the hard work for you and variable settings let you choose the precise texture you like, from coarse meal to finely ground flours. And once you taste the fresh stuff, you won't want to go back to store-bought. What mixers will the attachment fit? Wolfgang Mock fits AEG, Electrolux, KitchenAid, and Kenmore mixers. How do you care for and clean the unit? You simply dust the internal surfaces. You should not use water. What are acceptable millable substances? 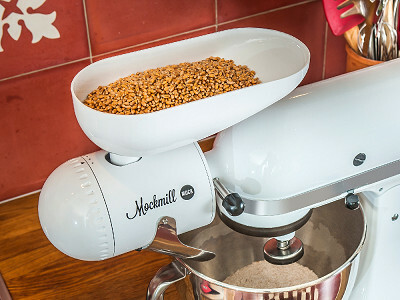 The Mockmill stone burr is only designed for use with the following substances, which must be under 15% (by weight) water content: Common dry grains including wheat (either hard or soft types), oat groats (dehulled oats), rice, triticale, khorasan (Kamut), spelt, buckwheat, barley, rye, millet, teff, quinoa, amaranth, sorghum, field corn (but not popcorn or sweet corn), dry lentils, dry beans (such as pinto, red, navy and kidney) and dry spices. What should you avoid milling? Never mill nuts or oily seeds such as sesame, flax, or poppy. Coffee beans may also contain enough oil to leave a film on the stones, which leaves them unable to take on and process grains. 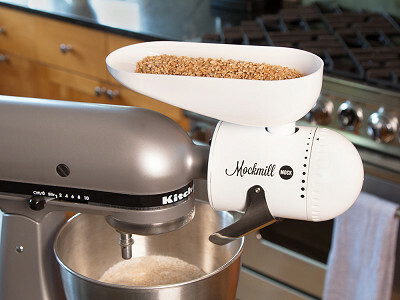 If this happens, take the Mockmill off the stand mixer, empty the hopper contents into a bowl, and remount the Mockmill onto the mixer. Then move the adjustment dial to a coarse setting. 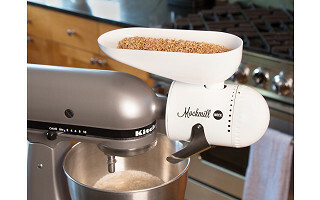 Grind a half-cup of an appropriately dry grain, such as wheat or rice, moving back and forth between coarse and fine. The milling action, particularly on the coarse setting, should quickly remove the problem-causing film. Hello everyone! 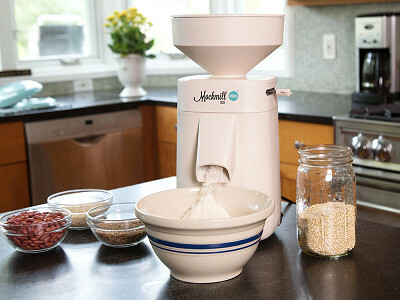 I'm proud to introduce the Mockmill to The Grommet. I'd be happy to answer any questions you have! Am sure looking forward to your questions! Wolfgang Mock knows grains. He’s been designing home grain mills for over 30 years and is passionate about spreading the knowledge that, when it comes to grains, freshness matters. When grains are commercially processed, the germ and bran are stripped out to prolong shelf life. But that’s where all the good stuff is—like fiber, vitamins, and antioxidants. By grinding your own at home, you can enjoy fresh, nutrient-packed wheat, rye, quinoa, and other grains whenever you want.